WELL-MAINTAINED CABIN NESTLED IN A GROVE OF 130' RED AND WHITE FIRS. RAISED PINE CEILINGS, PRIVATE BACK YARD . TAHOE-DONNER RECREATION PASS. 15 MINUTES FROM SQUAW, ALPINE, NORTHSTAR & SUGAR BOWL & 3/4 mi. to the Cross-Country, Horse Stables Center, and Euhr Valley. DONNER RECREATION PASS INCLUDED: Recreation facilities, Donner Lake Private Beach is 1/2 mile away. It is a 3 bedroom (Master with Ca King and raised pine ceiling, 2nd bedroom with Queen, 3rd bedroom with trundle plus a queen sleeping couch), 2 bathrooms (master & central). The living room is open and has a raised pine ceiling, with a large and efficient wood stove (wood provided). Open to a large dining area and well-equipped gourmet kitchen, overlooking a private forest of firs. The double garage is off of a level driveway, adjacent to a front covered entry way and a deck. Two couches and a 3/4 lounge chair with ottoman accompanies a full entertainment center (large TV on cable, DVD, VHS, wireless, music and video libraries), Two additional TVs (Trundle bedroom & Master). The back back deck has a new gas and electric grill with deck chairs, and beyond a private backyard has a picnic table and chairs. A Pass to Tahoe-Donner Recreation Center & areas + Discount to Alpine & Cross-Country Ski Facilities. 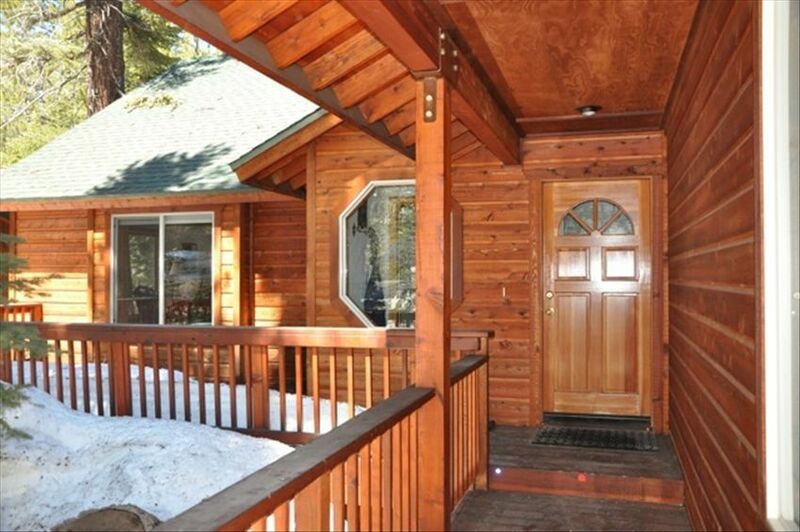 Wonderful mountain cabin in new condition, in one of the best stands of red and white fir trees in Tahoe-Donner. Great open high ceilings of pine. Large kitchen. Centrally located. the area affords wonderful skiing, hiking, boating and fishing which are outstanding, along with the wonderful recreation facilities: horseback riding, 18-hole championship golf course, Lake Sports. Thermostat Controlled Efficient Central Heating with floor vents. Towels, Sheets, Pillow Cases, Blankets, Comforters All Provided. Country Wood Stove that heats whole house. Firewood supplied. Large Open Floor Plan and Raised Pine Ceiling wtih Large Windows, Bay Seat. Open to Dining and Kitchen. GE four-burner gas stove and oven. Basic Pantry Items, such as seasonings. Many dishes and eating utensils are supplied. Table with 6 chairs; more chairs available. Panasonic Stereo and CD Player in living room. Toshiba DVD with Entertainment Center in living room. Books, Magazines, Information about Tahoe & Tahoe-Donner. Small table in closet of 3rd bedroom. All types of boats for rent at the Tahoe-Donner Private Beach on Donner Lake (Use by Guest Pass). 2 decks: Front deck and rear deck with fencing (protects small child or dog). deck chairs with pads on back deck. Chairs and Picnic table under the trees in the backyard. Some skis & plastic sleds in garage. Tahoe-Donner Champion 18-hole Golf Course. The Lodge Restarurant & Golf Center. Coyote Moon Golf Course - immediately across Northwoods Blvd. Single story; 2-step access to front entry; level driveway. Very negotiable for wheelchair access. We really enjoyed our stay in this comfortable and thoughtfully maintained, family-friendly home. Kitchen is well-appointed and backyard faces a beautiful evergreen grove. Close to Donner Lake for hiking, Boreal for snow sports, and Truckee for downtown. Charming wood burning stove. Very nice and comfortable. Would stay here again. Good location and close to town. Well equipped, comfortable cabin. Conveniently located to all of the amenities in Tahoe Donner. We had significant snow one day and the main road was plowed at sunrise and our driveway at 8 am which was appreciated as we wanted to ski! The host was very attentive even calling on our first evening to make sure everything was OK and to answer any questions. The air lock entry is very convenient for stashing boots and wet clothes. Would stay here again. Enjoyed five days with the family in this cozy, clean, well-kept cabin. Appreciated that the home was well maintained, the owner responsive, and the kitchen well equipped. Close to ski areas--Tahoe Donner downhill and cross country areas are just five minutes up the road. Would definitely rent again. return to it again. Thank you! The Permission allowing a dog is based on an agreement to the following: - Dog will not be left in the home alone - Dog will be clean & dry prior to entering home (paws & coat) - Dog will not be allowed on furniture, window seats, and beds - Dog will not be groomed or washed in the home - Dog hair will be cleaned up - Dog feces on the property will be removed (placed in garbage container) - Dog will not harm (chew or destroy) household property - A non-returnable pet fee of $200 and a returnable damage deposit of $200 is required (the damage fee will be returned upon a successful inspection by my Housekeeper). No other pets are allowed.